On April 25, the TDP unit for drilling waste processing was put into operation. The company, JSC Slavneft-KrasnoyarskNeftegaz made a big step towards ‘no-pit’ drilling process. Servicing unit dedicated to drilling waste utilization is to utilize dozens of thousands tons of drilling sludge. 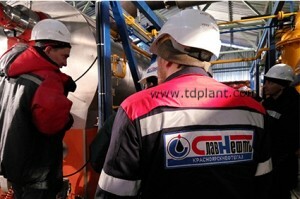 This is the first in Russia servicing center of such capacity that was launched at Kuyumba oil-gas field. In the limits of the environmental impact abatement program of the JSC Slavneft-KrasnoyarskNeftegaz. 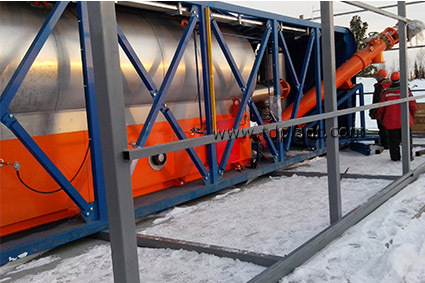 The servicing center is based on two pyrolysis TDP-2-800 plants that were put into operation. The acceptance was conducted in the presence of JSC Slavneft-KrasnoyarskNeftegaz authorities and engineering personnel. The ST PROMOTHODY Company took responsibility for construction of the servicing center and for the drilling waste utilization process. Disposal of drilling waste directly on site allows cutting oil production costs in part of removal and deposition of drilling waste, also in part of avoiding environmental penalties that were increased with the latest legislation acts. 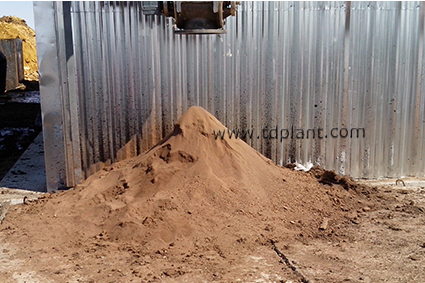 The TDP plant produces dry subsoil, 100% free of oil. It has all required certification enabling use of this product in road construction and in land reclamation. The key element of the whole process is elimination of waste at the end of oil production with emerging of marketable goods instead. All works related to design, construction, equipment manufacturing and fine-tuning, startup and putting into operation were conducted by IPEC personnel.